The mission of the Amtrak Historical Society is to be a venue of education and research concentrating on the preservation of the history of Amtrak. Opened on February 23, 2008 in La Plata, Missouri (a stop on the route of the Amtrak Southwest Chief) the exhibit is housed in an ex-Amtrak Mail Handling Car (MHC) right next to the Depot Inn & Suites. The exhibit features the complete collection of the Amtrak Historical Society and everything Amtrak related that TrainWeb.com has collected over its history as well as everything that has been donated over the years. The collection is maintained by volunteers and staff of the American Passenger Rail Heritage Foundation (APRHF) and the Passenger Train Historical Society (PTHS). Click Here for photos and more information. 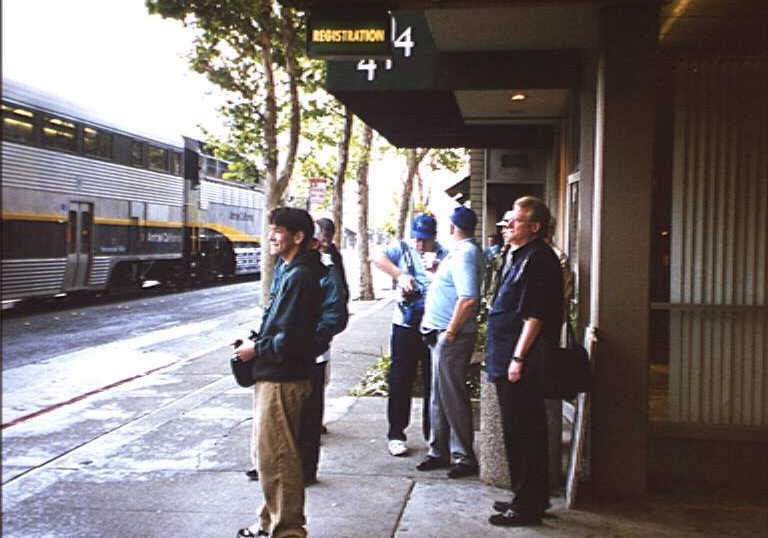 Photos & information from the 8th Annual Conference that was held in Portland, Oregon, April 26-28, 2002 which featured the 4449 & 700 steam locomotives in the Brooklyn Roundhouse, the Portland MAX light-rail, Portland Union Station, and a tour of the Amtrak Cascades Talgo trainset. Photos & Info From Past Conferences! The Amtrak Historical Society was founded in 1991 as a not-for-profit corporation under the law of the state of Illinois. The primary purpose of the Society is to preserve the history of Amtrak and to establish its place in the archives of U.S. railroading. Although formed with the approval of the National Railroad Passenger Corporation (Amtrak), the Amtrak Historical Society is a separate entity and is not affiliated with, nor funded by Amtrak. http://www.amtrakhistoricalsociety.org - Copyright © 1998-2009 - Amtrak Historical Society.